The festival of lights, Diwali saw a plethora of celebrities wishing fans and followers a prosperous year ahead. And doing just that was the cast of the Ali Abbas Zafar directorial Bharat from the sets of the film. 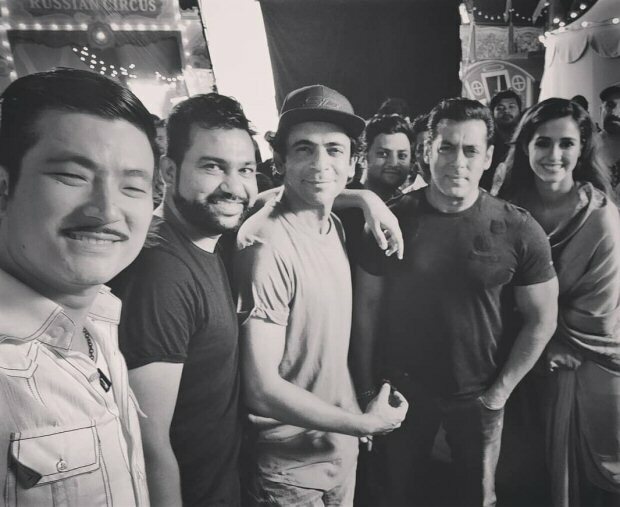 In fact, Salman Khan, Disha Patani, Sunil Grover and Meiyang Chang, who incidentally also features in the film posed for a group selfie wishing the audience. Sharing the image on his Instagram account, Meiyang Chang added, “उम्मीद करता हूँ आप सबकी #Diwali धमाल रही, क्योंकि असली धमाका तो अगली #Eid पर होगा ???????????? @beingsalmankhan @aliabbaszafar @atulreellife @whosunilgrover @dishapatani @bharat_thefilm #Bharat”. While the Diwali wishes were certainly sweet, what caught our attention was the backdrop of the location. Incidentally, one can clearly see that the sets are that of a Russian Circus with the words written in clear font. Well, with a circus being added to the film, we are now all the more intrigued to watch the film. As for the film itself, Bharat, that is directed by Ali Abbas Zafar is said to be based on the film, An Ode To My Father, and is slated to release on Eid 2019. Varun Dhawan celebrates Diwali in style and here’s the proof!